Whoa you guys, there's only 9 days left until Christmas! Are you freaking out yet? Have you gotten everything done you need? I think I'm just about done now. I just have one more project to finish, and that should be more fun than anything. 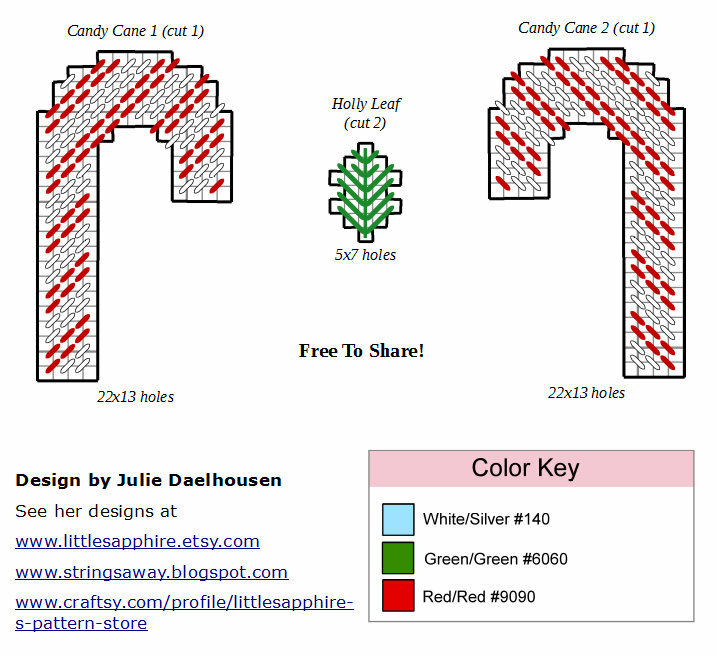 This week's pattern is for those last minute gifts you're thinking about. 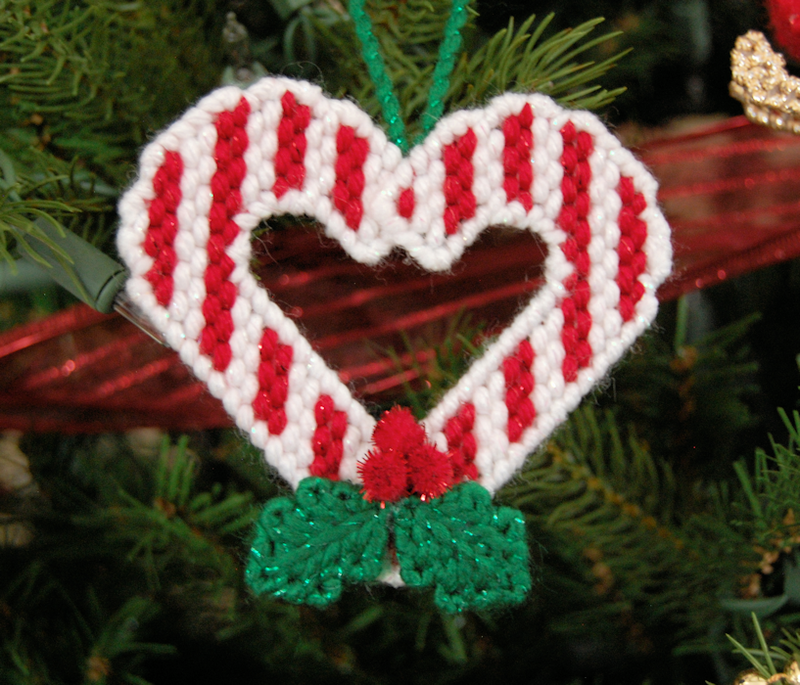 Something small but thoughtful to give to your friend at work or to put in Aunt Erma's stocking. It's simple but pretty and should let the receiver know how you feel about them. Or you could keep it all for yourself! Overcast outside edge of candy canes with White yarn. Overcast outside edge of holly leaves with Green yarn. Using photo above, glue the candy canes together to form a heart, then attach the holly leaves and pompoms. Click the image above to see it larger. You may share this pattern however you please as long as you don't alter it or claim it as your own. 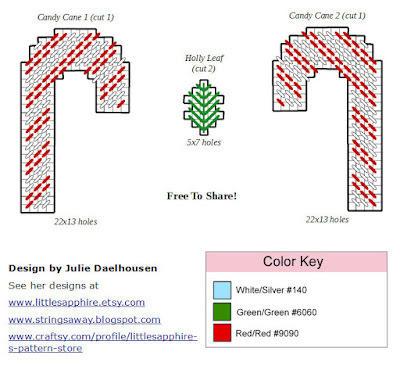 You may sell items made from this pattern. However, you may not sell this pattern. Sorry I haven't been blogging so much lately, guys. This is my first Christmas when as a designer/blogger and I'm finding it hard to balance my responsibilities as a homemaker and all the stuff I want to be doing for my business and my blog. And especially with this wicked snow we've been getting! I swear this is the most we've ever gotten this early. It's not even officially winter yet and we have three feet of snow in the yard!! 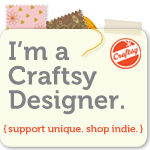 Anyway, I just wanted to let you all know that my blog will probably be taking a back seat for the rest of the holiday season, but I do promise to keep blogging when I can and I'm going to try very hard to get a new pattern up every week. And then once January starts, I'll be diving right back into all this fun stuff!